On September 8, The Miami Climate Alliance is hosting the Miami Rising for Climate Jobs and Justice Concert. 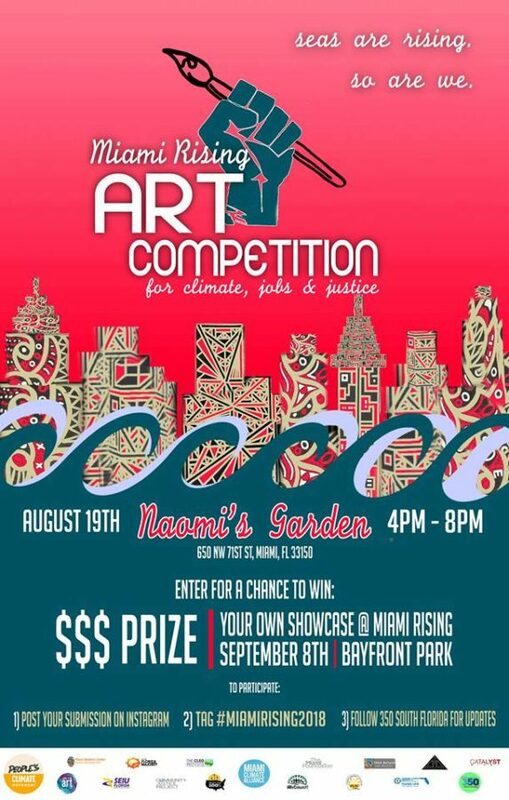 As a prelude to that, 350 South Florida is hosting a LIVE VISUAL ART CONTEST on Sunday, August 19th at Naomi’s Garden. Cash prizes will be awarded! Participating artists will be provided with materials and should be able and comfortable to complete the work within three hours. Work will be displayed at the September 8 event taking place in Bayfront Park. Life Is Art will hold the art until that time. All art will be for sale at the September 8th event with 100% (minus any credit card/bank/Paypal fees) being paid to the artist. Price to be determined upon completion of the work. To compete, fill out the form below. Once we receive your submission, your photo will be put up on our social media platforms with a voting link. You share that on your own social media, encouraging your followers to vote. Your fans can assist you in being selected by voting, liking and sharing your photo! Participants will be selected by their responses to questions on submission form (30%), the votes they receive (30%), and their social media engagement(40%). The People’s Climate Movement is a MOVEMENT, and we need you to rally up your fans and make this an unforgettable year using your unique artistic voice to do so! Upon selection, artists will be brought together August 19 in Miami, to compete live. The winner will receive a cash prize of $300! Best in show pieces will be curated into an exhibition at our Miami Rising for Climate Jobs and Justice at Bayfront Park September 8, 2018. By applying to this Call for Artists, you signify understanding that you will be PAINTING LIVE during your time at the show. Each artist will receive specific time slots during which they will be painting. This call is open to artists whose primary live or work location is within Palm Beach, Broward, and Miami-Dade counties. Application does not guarantee inclusion. Spaces are limited. If you are selected, YOU WILL BE NOTIFIED VIA EMAIL and you must respond to the notification email within 24 HOURS to confirm or your spot will be given to another artist. How do you think art can illustrate the climate issues facing Miami and the World? Submit 3 sample images of your work. If possible, include 1 mural sample. Hit the SEND button only ONCE. By agreeing to participate in Miami Rising, the above agrees to protect, keep and save Life Is Art and Miami Client Alliance, and all their officers and staff, forever harmless from any damage, loss, cost, liability, or expense that arises from their being at this event. This agreement covers full setup, run of the event, and takedown. By signing above, you indicate your approval of all information contained. * I release Life Is Art, Miami Climate Alliance, and promotional partners to use my name, image, and company information in the promotion of the event. The Miami Rising Art Competition and the Miami Rising for Climate Jobs and Justice Concert are being produced by Life Is Art on behalf of 350 South Florid and Miami Climate Alliance.